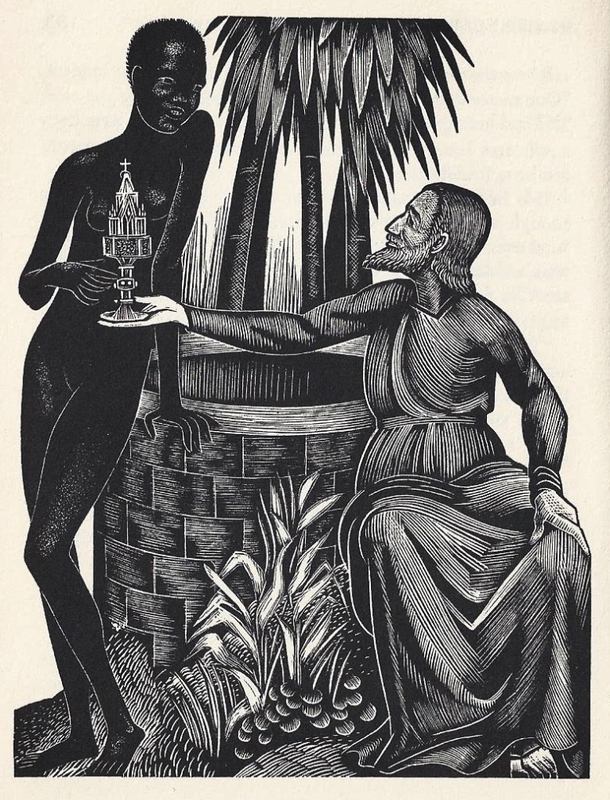 The Adventures of the Black Girl in her Search for God by George Bernard Shaw ~ 1933. This edition: Capricorn Books, 1959. Contains original illustrations by John Farleigh, and detailed Afterword by the author. Paperback. 96 pages. My last book read of the 2014 Century of Books project, and a fitting end to a year packed full of occasionally surprising, always thought-provoking, and frequently entertaining reading. Unexpected finds such as this have me looking forward to what future surprises I will doubtless discover among the dusty old tomes of yesteryear. This is a red-hot coal of a satirical allegorical tale. It’s as relevant today – perhaps even more so – as when it was published between the world wars, when all of the established “truths” were up for questioning. “Where is God?” said the black girl to the missionary who had converted her. “He has said ‘Seek and ye shall find me'” said the missionary. The black girl, a fine creature, whose satin skin and shining muscles made the white missionary folk seem like ashen ghosts by contrast, was an interesting but unsatisfactory convert; for instead of taking Christianity with sweet docility exactly as it was administered to her she met it with unexpected interrogative reactions which forced her teacher to improvize doctrinal replies and invent evidence on the spur of the moment to such an extent that at last she could not conceal from herself that the life of Christ, as she narrated it, had accreted so many circumstantial details and such a body of homemade doctrine that the Evangelists would have been amazed and confounded if they had been alive to hear it all put forward on their authority. Indeed the missionary’s choice of a specially remote station, which had been at first an act of devotion, very soon became a necessity, as the appearance of a rival missionary would have led to the discovery that though some of the finest plums in the gospel pudding concocted by her had been picked out of the Bible, and the scenery and dramatis personae borrowed from it, yet the resultant religion was, in spite of this element of compilation, really a product of the missionary’s own direct inspiration. Only as a solitary pioneer missionary could she be her own Church and determine its canon without fear of being excommunicated as a heretic. (A) Candide-like fable about an African woman who has the audacity to question the heavenly father missionaries have taught her to worship. Armed with a decaying Bible and a Zulu fighting stick, this “interesting but unsatisfactory convert” sets off through the jungle to learn why God made a world with evil. In a deceptively genial prose style that sometimes recalls Rudyard Kipling and Lewis Carroll while it skewers the hypocrisies of European colonialism, Shaw recounts his heroine’s encounters with a procession of would-be god figures: an Old Testament deity demanding suffering and sacrifice; various prophets and preachers, from Peter and Ecclesiastes to Pavlov and Shaw himself; a Muslim who insists on male superiority because “God made Man before he made Woman” (“Second thoughts are best,” replies the girl); and Jesus, reduced from being a teacher to sitting as an artist’s model. 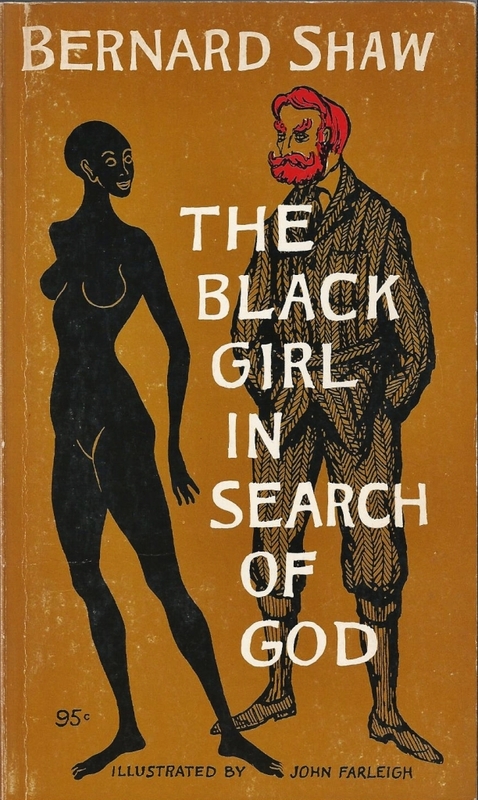 Written in South Africa in 1932, the novella was banned in Shaw’s native Ireland and attacked by churchmen as subversive (“They are quite right from their point of view,” Shaw responded); it attacks the racist and sexist underpinnings of religious dogma and prophesies the emergence of feminism and multiracialism (in the end the girl tames and weds a Shavian Irish socialist). Have any of you read this one? Brilliantly subversive stuff, whether one personally agrees or disagrees with Shaw’s agnostic premise. For what it’s worth (in case any of you were worried 😉 ), Jesus himself comes off quite well, though Shaw denies his deity. I can see why this received such a scalded response by the churchmen of the time. Farleigh’s illustrations are perfect. I want to get my hands on an early hardcover copy of this one, for its sheer physical beauty as much as for its smouldering content.